This variety was found some years ago by Mauro Peixoto in or near Esmeril, in São Paulo state (Brazil). 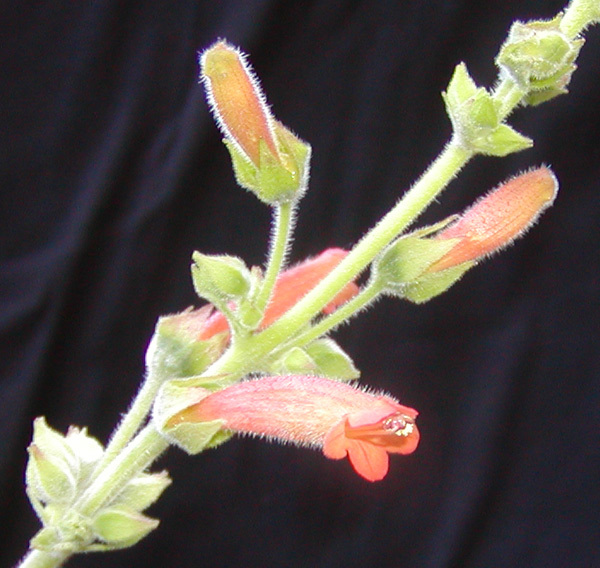 Alain Chautems views this plant as within the range of variation of the species Sinningia warmingii. Compared to the standard variety, this one has a flower with a color more toward orange, and (on my plant, anyway, so far) no tendency toward whorled leaves. Instead, it has a peculiar shoot pattern, with new shoots growing parallel to the main shoot axis (but this may be a one-time thing). 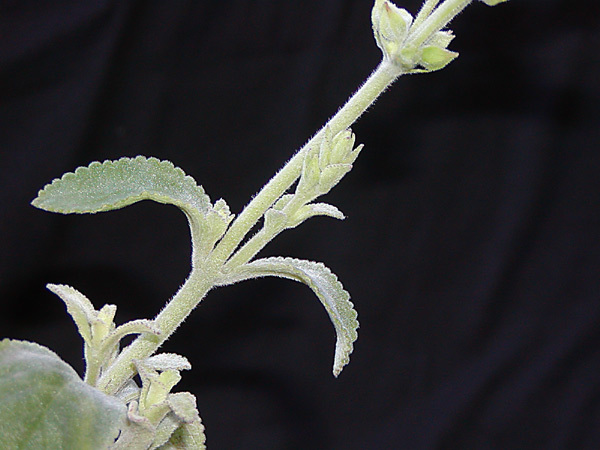 Flower size is about the same as the normal S. warmingii, and both varieties have the cup-shaped calyx with the pointed calyx lobes held well away from the corolla. 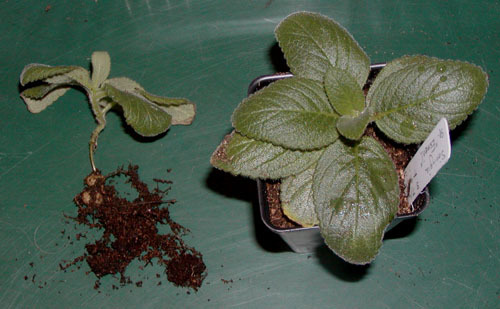 This picture, taken in November 2006, shows two four-month-old seedlings of this variety. The one on the left had two tubers attached by the sort of underground stem that Sinningia sp. "Black Hill" has connecting its satellite tubers. S. warmingii has underground rhizomes too, as can be seen by a picture. This picture of a tuber shows two lobes. One has all the growing points (dormant buds at this moment). The other has plenty of roots but no obvious shoot buds. It is only loosely attached to the main tuber, so could be easily separated for propagation purposes, if it were to sprout on its own. 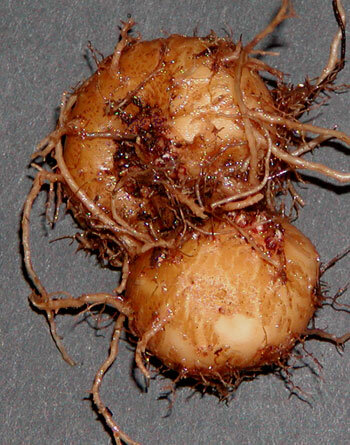 Both tuber lobes are about 2 cm [3/4 inch] in diameter. Feature table for Sinningia "Esmeril"
Leaves The older the plant gets, the more they resemble the standard S. warmingii. Dormancy Unpredictable! Mine sprout quite late in the spring. Flower Tubular, orange, just under 4 cm long. From seed Three years for me, but you can grow things better than I can. Hardiness Has tolerated 32 F [0 C] in my back yard. Propagation Stem cuttings root fairly easily. Recommended? A little too early to tell, but mine bloomed at a smaller size than the standard S. warmingii. In my yard, the latter can form rather sizable plants without a single flower. If the "Esmeril" variety blooms reliably on reasonably compact plants, that would be a big plus. On the other hand, the stems tend to flop, while those of the standard variety are sturdy and do not fall over. Mauro Peixoto's Brazilian Plants site has a page about this plant.